It’s easy to look at a book instead of reading it. I’ve been there too: reading a textbook chapter without retaining enough information for an exam, reading self-improvement books without slowing down enough to think critically about the advice and plan how I’m going to use it. Fortunately, I remembered one of the acronyms that I picked up in those grade school lessons on how to read better. SQ3R: Survey, Question, Read, Recite, Review. Step 1: Survey. No, this doesn’t mean ask other people what they think of the book. Here, “survey” is like what a surveyor does to land – get an overview by looking at the structure. Look at the table of contents for a book, look at the headings, look at the first lines of paragraphs. This will give you a quick idea of what the section you’re reading will cover. Step 2: Question. Before you dig into the book, think about the kinds of questions you should be able to answer after reading. If you’re preparing for an exam, think about the questions that would likely be there. If you’re reading for your own learning, think about your goals and how the book can help you. Write those questions down. Index cards are handy for review, because you can jumble them up and test yourself. Step 3: Read. Now you read in more detail. As you read, write more questions. Write hints to help you answer them during your review, and make sure those hints are easy to hide or refer to when you’re reviewing. The backs of index cards work well, or you can use the Cornell method when taking notes. Step 4: Recite. Answer your questions without referring to the text. You can answer the questions out loud or you can write the answers down for exam practice. Step 5: Review. If you weren’t able to answer all of your questions confidently and correctly, go back and review the sections that need more work. Schedule some time the next day and in future review sessions to go over the questions again, without referring to your hints or to the text unless you need the reminder. SQ3R – reading with questions in mind will help you get the most out of what you read. Good luck! 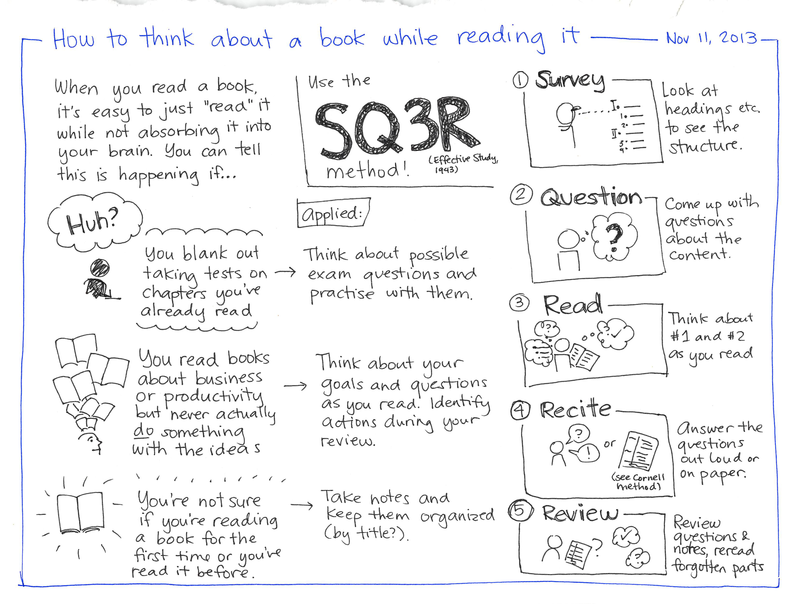 You might also like my notes on How to Read a Book (Adler and van Doren), my book workflow, and how I read books and do visual book reviews. Want to ask questions or share tips about learning? Comment below or check out http://sach.ac/learn for more resources.